Jaume Huguet was a Spanish painter. He painted many religious pictures such as the one shown here. In this painting, does it seem that Jesus is looking at you? 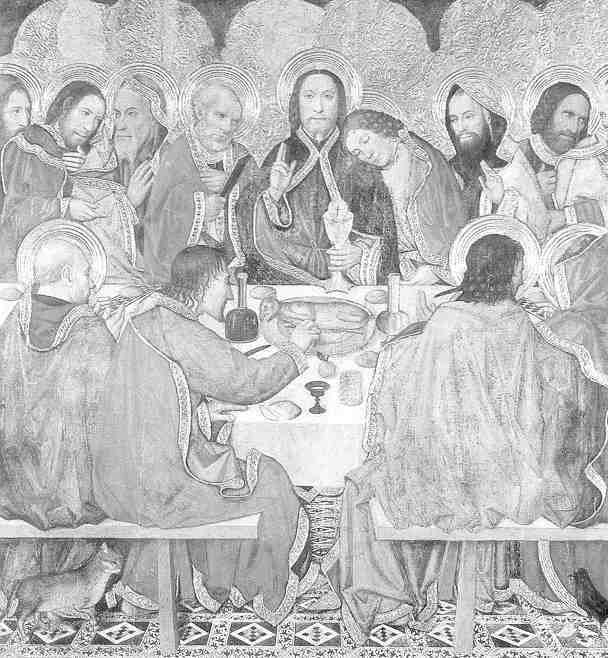 You will notice that the artist makes his clothing darker than the clothing of the disciples around him. This calls your attention to him as the centerpiece of the painting. The man dipping his hand in the dish is Judas Iscariot. All the others are drawn with a halo around their heads, Judas is not shown with one because he is about to betray Jesus. The picture was painted on wood, probably around 1470. Huguet lived in Barcelona, Spain. The painting of The Last Supper hangs in a museum in Barcelona. Press "Go" to search for books about Bible art. This page displayed 36,224 times.